I recently bought a Kali Chakra Plus helmet for my bike. This is the link with the specs. It has the inner clutch system made from plastic in order to adjust the fit which is plastic and onto which the padding is placed. I want to remove the plastic clutch for traveling purposes (I need to put it inside a bag) and it looks like it can be removed but I'm not sure. Does anyone know if it can be removed? If you mean: is this particular system in this helmet designed to be user removable? Probably not. If you mean can you remove it and put it back together correctly without compromising its function or safety? Maybe. You could figure out how to dissemble it and photo-document every step. I'd personally figure out a different way to pack it, as that seems like much less hassle. Not the answer you're looking for? Browse other questions tagged mountain-bike road-bike safety helmets or ask your own question. Can I soak my helmet in water? What's the best way to secure helmet straps? 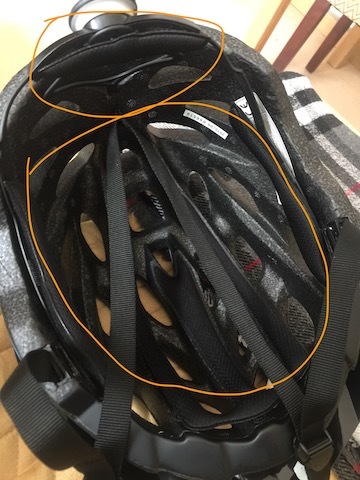 How to remove the visor of a POC Trabec helmet? Does a helmet become useless after it slips from the hand and hits the ground?